If you have try using your verve card to make payment and you get a message saying your card isn't registered for safetoken ,it simply means your card data base is not on quickteller for online transactions/bill payments . 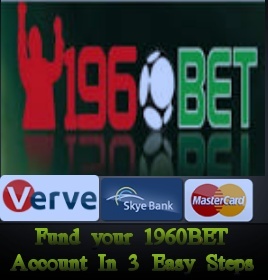 To enable you to use your verve / master card to make payments online, such aa to fund your 1960bet account online ,you must register the Verve card for Interswitch Safetoken Service .For banks like GTB FIRST BANK ,UBA,ACCESSBANK,etc they get it activated immediately for you they even go as far as installing their quickteller Mobile app on your phone if you permits them. With the Bank Quickteller apps on your phone you need not go to any ATM Machine you can do the card activation right on your phone.Get the step here if you have your bank Quickteller apps on your phone.